Joy Creek Photo Archive (c) all rights reserved When it is not in bloom, the broad, semi-glossy strap leaves of this South African lily relative have a commanding presence in the mixed border. They are 28 inches long and more than three inches wide. Their fleshy skin is green with a hint of burgundy and there is burgundy stippling at their exterior bases. From mid- to late summer, pineapple-like inflorescences rise on burgundy stems. Individual flowers are whitish with purple centers. 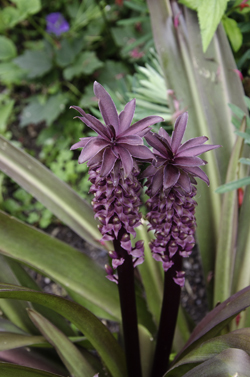 This is smaller in scale than Eucomis 'Oakhurst'. July and August. 24 in. x 45 in.